Berries! They're juicy, they're colorful, they're delicious. Pop them in your mouth and savor the small, divine pleasure. Did you know that many berries also pack a punch when it comes to your health? 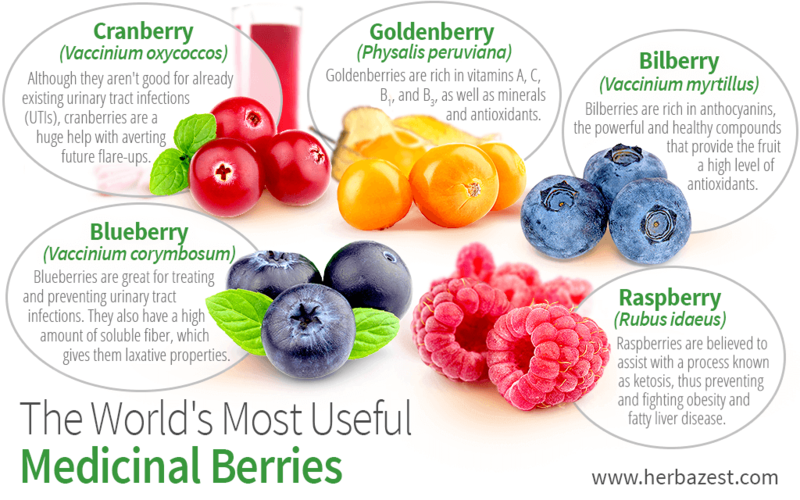 Maybe it sounds too good to be true, but berries have nutritional and medicinal benefits. Just read about the five below and find out for yourself. You'll go berry crazy. Blueberries are one of the highest-ranked fruits for antioxidants due to the presence of a type of flavonoids called anthocyanins, which are also responsible for the fruit's dark blue color. Blueberries, as much as cranberries, are great for treating and preventing urinary tract infections. Its antioxidant compounds have shown an antibacterial action, blocking the adhesion of E. coli to the walls of the urinary tract. These tiny berries also have a high amount of soluble fiber, which gives them laxative properties that help regulate gastrointestinal functions. Cranberries are most well-known in the medicinal world as being the best herb for urinary health, especially recurring ones. Scientific evidence points out that although they aren't good for already existing urinary tract infections (UTIs), cranberries are a huge help in preventing future flareups. Their prowess lies in their strong acidity, which prevents bacteria (such as E. coli) from attaching themselves to the walls of the urinary tract and subsequently causing infection. Fortunately, it seems as though taking supplements and drinking cranberry juice work equally as well. Also known as Cape gooseberry, Inca berry, and giant ground cherry, this bright yellow-orange fruit is native to South America but is now cultivated in places like England and South Africa. Goldenberry is rich in vitamins A, C, B1, B3, minerals, and antioxidants, and has been attributed different medicinal properties during its long history of use. The best-regarded one by experts is its ability to fight intestinal parasites, but it's also been recommended to combat asthma, strengthen the optic nerve, and treat throat ailments. Plus, it has even been shown to have antiulcer properties and lower cholesterol. With a sweet-tart taste to boot, goldenberry is sure to please. Bilberry is a relative of the blueberry: they do, in fact, resemble each other. However, bilberries are richer in anthocyanins, the powerful and healthy compounds that give the fruit its dark color and high level of antioxidants. Most well-known for their great benefit for eye health, anthocyanins are also helpful for blood circulation. When consumed regularly, bilberry has been known to fight against such conditions as chronic venous insufficiency (CVI), diabetes, or high blood pressure, especially related retinal problems. Sure, these soft and sweet berries are a pleasure on a warm summer day, but they could also be your new best dieting tool. Raspberries contain compounds known as ketones, which are closely similar to ones the body produces when metabolizing stored fat into energy. This is why raspberry is believed to help a process known as ketosis, thus preventing and fighting obesity and fatty liver disease. As a bonus, raspberry leaves are often brewed for tea in traditional herbal medicine to help regulate menstrual periods and induce labor. Vitamins and antioxidants. Portable and colorful. Healthy and delicious. What's not to love? Add the berries above (and others!) to your daily repertoire (think: smoothies, oatmeal, sangria, salads), and you simply can't go wrong.